Churchill and Orwell is a perfect gift for the holidays! Thomas E. Ricks is an adviser on national security at the New America Foundation, where he participates in its "Future of War" project. He was previously a fellow at the Center for a New American Security and is a contributing editor of Foreign Policy magazine, for which he writes the prizewinning blog The Best Defense. A member of two Pulitzer Prize-winning teams, he covered U.S. military activities in Somalia, Haiti, Korea, Bosnia, Kosovo, Macedonia, Kuwait, Turkey, Afghanistan, and Iraq. He is the author of several books, including The Generals, The Gamble, and the number one New York Times bestseller Fiasco, which was a finalist for the Pulitzer Prize. 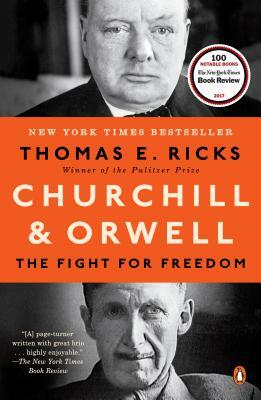 His newest book, Churchill and Orwell: The Fight For Freedom, is a New York Times bestseller.